Information and pictures for this article was provided by Ma’am Cai of Earth Island Outdoor Environmental Club. PinoyMountaineer expresses much gratitude to their group for their support and for making this article possible. 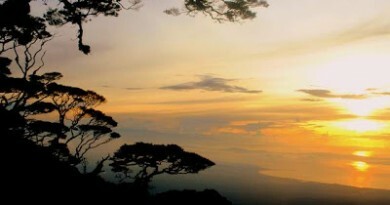 A favorite of hikers in Mindanao is one of the island’s most beautiful and yet formidable mountains, Mt. 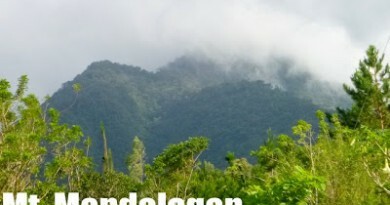 Candalaga in Compostela Valley. Home to the ethnic Mandayan and Mansaka tribes, the mountain is untamed and wild, as it is beautiful, steeped in folkore and blessed with a forest with a tantalizingly deep and dense foliage. Numerous waterfalls deck the mountain, and even at the start of the trail you will be welcomed by Marangig Falls (see picture), which is actually a system of waterfalls in 13 levels. 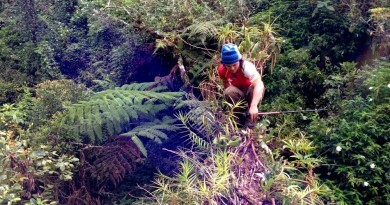 Into the mountain, the flora and fauna is impressive: there are rafflesia, orchids, ferns, and trees covered with moss. Legends further beautify the mountain, and most of them are based on the belief of beings dwelling in the forests. One folktale is about Maranging Falls. It was said that a horn of a ship known as Donya Marangig would be heard by the residents near Marangig Falls, which means the ship is going to sail away. Its passengers are white, enchanted beings. The river would overflow and the rocks would move as if the ship was in motion in the waters, but the vessel cannot be seen. One local who returned from abroad said that he saw the ship somewhere in Europe. Meanwhile, on the other end of the trail, in Tagbibinta Falls, women are not advised to go there alone. It is said that if a girl takes a bath in the catchbasin alone, an enchanted prince would show up and invite her to be his wife and take her to his world. Many more stories can be heard if you talk with your guides up the mountain. The trek is difficult – and therefore very exciting. To begin with, rope works will greet you at the very start at Marangig Falls. 90% of the trail going to Camp 1 will be river trekking and rope course, and this will consume the entire Day 1, the trekking time requiring over 8 hours. The next day is the jungle trekking from Camp 1 to Camp 2, lasting for four hours (here is where you can encounter rafflesia off-trail, location known to guides). Then after setting up camp at Camp 2, the summit is just an hour away. The summit does not afford any views, but in itself it is very nice, completely enmeshed in moss from the ground to the trees. The rest of the day is spent going back to Camp 2 and staying there for the night. Finally, Day 3 is a day-long descent to Tagbibinta Falls, another attraction of the mountain. Here you can take your much-deserved relaxation, for the Candalaga climb is said to be really difficult and will consume three full days. If you want to get back to Tagum City on Day 3, adjust the itinerary. Either way, Mt. 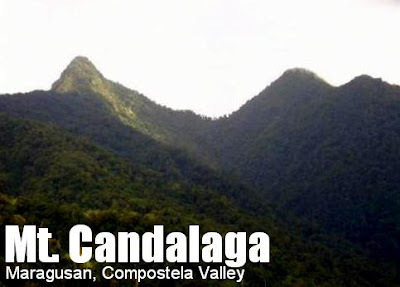 Candalaga will really prove to be a unforgettable, action-packed climbing experience! Logistics. The person to contact is Jonald Buyoc of Maragusan Tourism Office. Inform him of your intention to climb beforehand. There is a municipal ordinance about trail guides: 1 guide for every 5 persons; P180/day. Porters are available with similar rates. 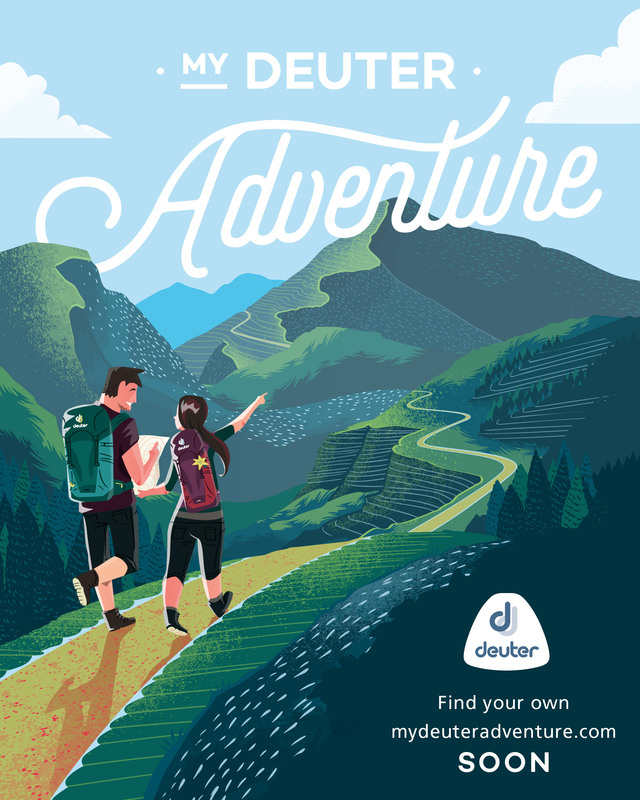 The tourism office will provide the guides, who will be waiting for you at the jumpoff. Prior to that, registration must be done at the tourism office itself. Registration fee is P110/person as of May 2008. Transportation. From Manila, the major staging point is still Davao City. From there, take a bus/van from the SM City terminal to Tagum City. From Tagum, you can take a bus/jeep to Maragusan, costing P100. And from Maragusan to jumpoff, you have to take the famous habal-habal (modified motorcycle that can carry several people!) for P25. Climbing notes. There are no reliable water sources beyond Camp 1, so plan accordingly. On the other hand, there is no reliable cellphone signal throughout the trail until Camp 2; there is cellphone signal for Smart and Globe in Camp 2 and the summit. Safety. There are no reported deaths/injuries in the mountain. There are occasional reports of armed group presence, but the guides are familiar with them and they have not known to cause harm/offense to any mountain climber. Most of the content of the Trivia section were incorporated with the ‘Background’ section in this page, such as the legends of Mt. Candalaga. The particular rafflesia species in Candalaga is Rafflesia mira, the largest among the rafflesia in the Philippines, with a diameter of 22-29 centimeters. 12 Comments on "Mt. Candalaga (2,402+)"
hello po, im Abra from Davao City, im also a Mountaineer pro hindi ko pa na akyat ang Mt.Candalag so i need some more info about Mt.Candalaga 'cuz in our Org. I belong to Mt.Candalaga Batch of 27th Anniv. Kaya i need help for more info kasi gs2 nming umakyat don ng mga ka batch ko. hrs my # 09498515325 or add me on FB Aj Mcboner (Jah). Hello po. Meron ba kayong nakitang mga stick insects at leaf insects sa Mt. Candalaga?